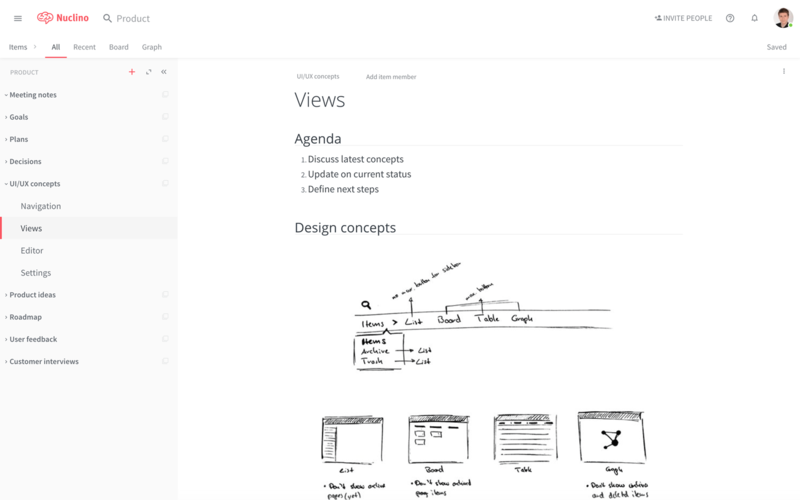 Brainstorm product ideas, capture user feedback, and more. Productive collaboration is the backbone of any successful product strategy, sprint, and release. To successfully deliver a great product, from concept to completion, your product team needs to be guided by a clear, unified vision of the product roadmap. Whether you follow a traditional waterfall process or an agile framework, Nuclino can help you brainstorm ideas, prioritize, communicate, plan, and execute product releases and upgrades, with your team working as one and shipping real value to your customers faster. Collaboratively capture ideas from brainstorming sessions. Centralize user feedback in one place accessible by your whole team. Plan and track the product roadmap in a visual way. Collaborate with your team in real-time on any product-related content. Use comments to give and receive feedback on content like product ideas. Embed media like images, videos, sounds, and more.